Sometimes it may seem hard to get a simple thread stack dump from your JRockit. You may for instance have started it using the -Xnohup (-Xrs) option, or as a service. I’ll list three different ways of looking at your threads in such situations. The first way of getting your thread dump is to use jrcmd. My previous blog shows some basic jrcmd usage, so I’ll just mention the command name: print_threads. Basic usage is jrcmd <PID> print_threads, for example jrcmd 780 print_threads. 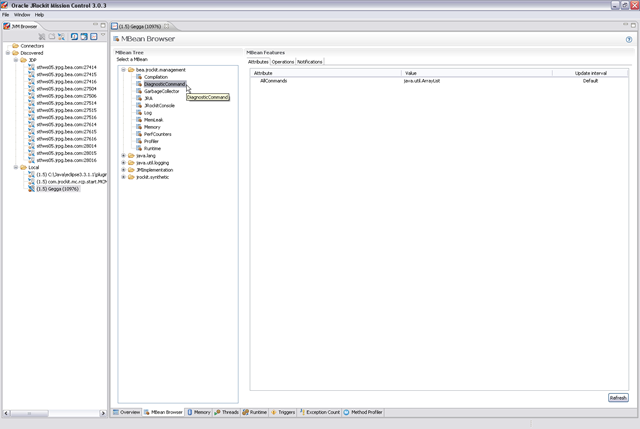 The second way is to simply start the management console on the JRockit you want to monitor. 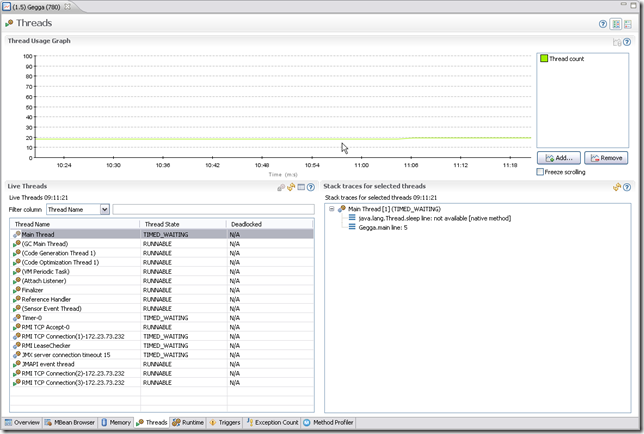 After connecting the console to the JVM and switching to the threads view, you should be looking at something similar to the screen shot below. 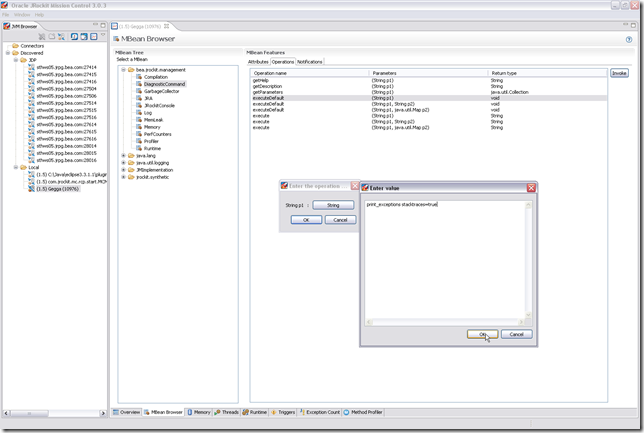 The third way is to use the MBean Browser’s capability to invoke arbitrary operations on MBeans (also described in the last blog). 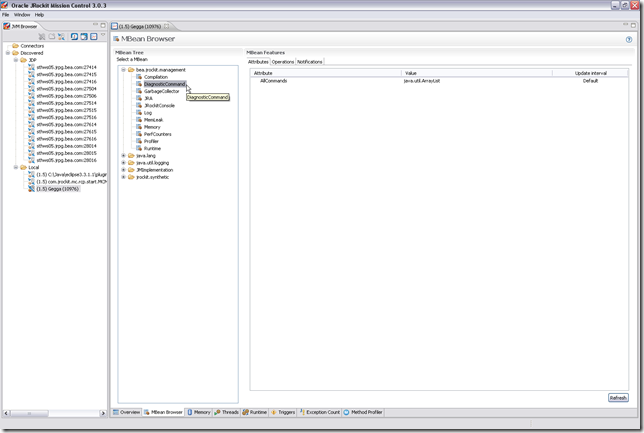 Go to the MBean Browser in the JRockit Management Console. Select the DiagnosticCommand MBean, and switch to the operations tab. Select the execute operation that takes a String argument and returns a String. Click the String button, and fill in the argument print_threads. There are also ways of doing this programmatically, for example by using the JRockit JMAPI, or by invoking the execute operation programmatically as described in another old blog. Exception profiling is the business of finding out what exceptions are being thrown within your application and from where. 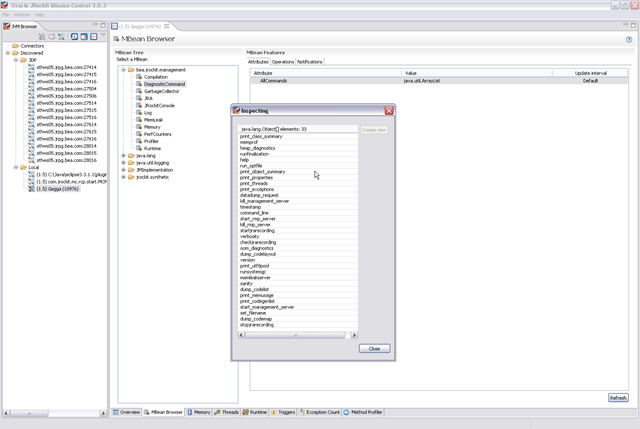 In JRockit Mission Control you can find out how many exceptions have been thrown using JRA, and you can count the exceptions using the JRockit Management Console. 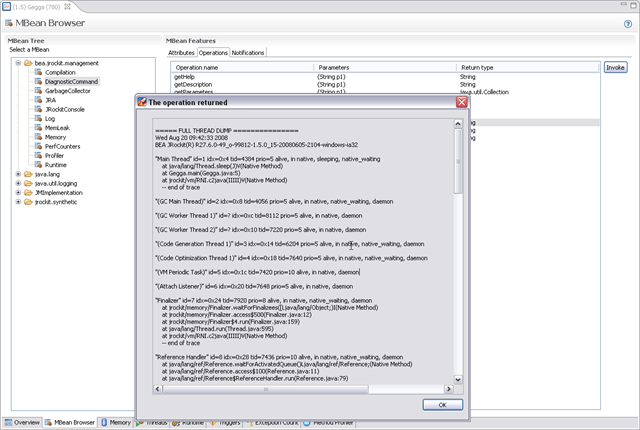 Sadly there is no way of doing powerful exception profiling (i.e. 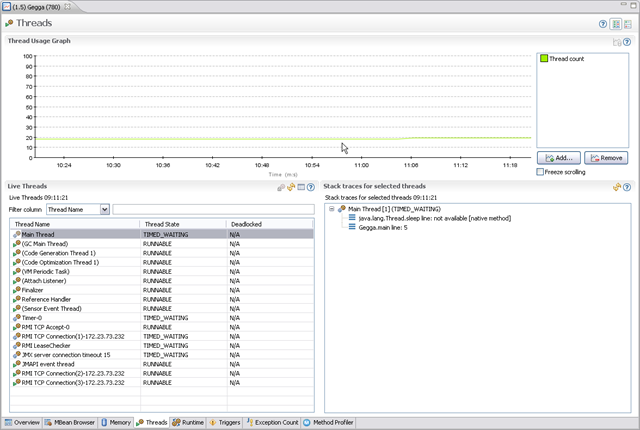 looking at the stack traces for the exceptions, aggregating them and visualizing them directly in the JRockit Mission Control Client) just yet. This will be incorporated in a future version of Mission Control. For a list of valid verbose options, please see http://e-docs.bea.com/jrockit/jrdocs/refman/optionX.html#wp999543. Sometimes you really just want to enable this profiling for a little while, for example to avoid cluttering your log files. Then there is a nifty tool for JRockit called jrcmd you can use to turn on/off the exception profiling. It can be found under JROCKIT_HOME\bin\. For more information about a specific command use ‘help <command>’. Parameters to commands are optional unless otherwise stated. 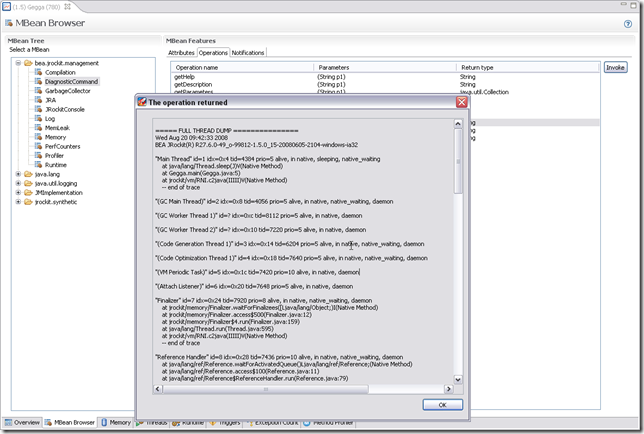 Enable printing of Java exceptions thrown in the VM. Values for the parameters can be "true|all|false"
Now, select the operations tab and the executeDefault method that takes a String argument and press invoke. 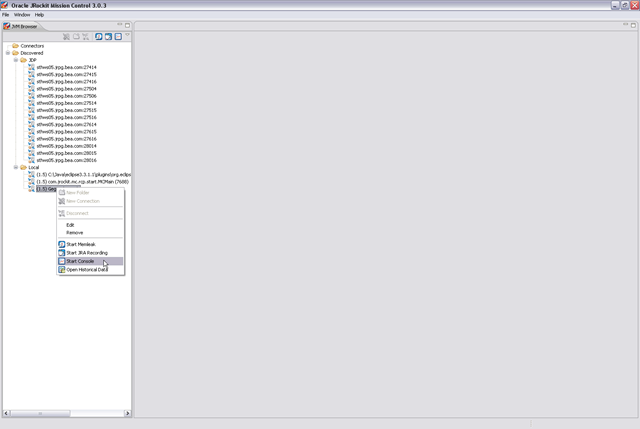 This will provide you with a dialog with push buttons for the arguments. In this case a single button with the label String. Press the String button and fill out the command. For example, print_exceptions stacktraces=true. 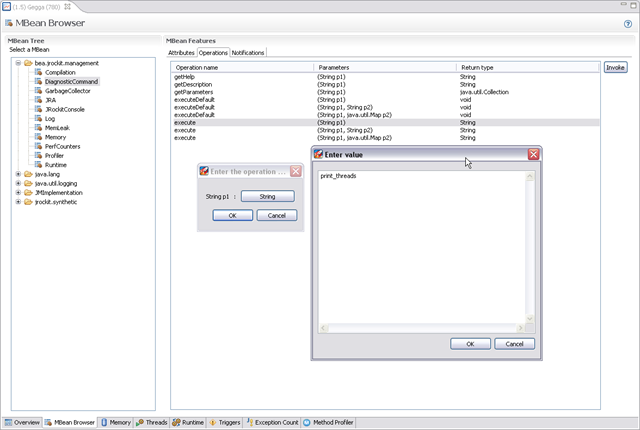 Press Ok on both of the dialogs and exception profiling should now be enabled. To turn it off again, just invoke the operation again and enter print_exceptions exceptions=false, analogously with how you would use jrcmd. An even easier way for Oracle employees is to pick up a recent internal build of JRockit and use the Diagnostic Command tab in the JRockit Management Console. 🙂 Soon coming to a JRockit near you! This year JRockit Mission Control will be represented at Oracle Open World! I’ll have one session and three hands-on labs. This is totally ridiculous. A few weeks ago the first catastrophe struck in my very expensive, quite recently (4-5 years) built house. I came home from work and water was flowing out from the garage. A flexible pipe in my garage, the one bringing water to my heater, had ruptured. It had, interestingly enough, rusted. The insurance company came along, tore down the inner walls and put drying equipment in the garage. They do insist, however, that the broken pipe isn’t covered by the insurance, and that I ought to pay for the guys who fixed that problem myself. Next catastrophe occurred just a few days ago, when a hard rain storm hit Stockholm. It suddenly started trickling water from through the outer walls that had been laid bare by the removal of the inner walls by the insurance company. It was quite evident that something is the matter with the moist barrier to the rear of the house. Experts say that there is probably just one way to proceed, and that is to dig up all around the house, and have a closer look at the foundation. There goes the lawn, the nice patio on the rear… Aaaaaaargh!